The steam passenger ferry Dawn was built at the Lake Washington Shipyard in 1914. The 65-foot long wood hulled boat was affectionately referred to as the "Queen of the Lake" by the many passengers that she carried up and down the lake during her 32 years of service. Her primary route was between Leschi Park and Mercer Island, long before there were any bridges on Lake Washington. In 1946, six years after the I-90 bridge put the Dawn out of work, the Seattle City Council had her scuttled in the south end of Lake Washington by the Atlantic City Boat Yard. 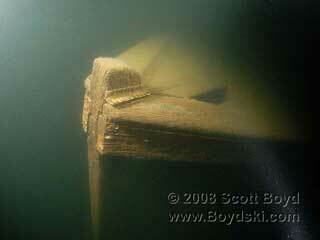 There are a large number of wrecks nearby, making it apparent that scuttling old boats was a common practice. Divers visiting this remarkable wreck today are treated to an elegant, remarkably well preserved vessel that is sitting upright in 120 feet of cold, dark lake water. The Dawn is one of my very favorite dives, but she is fragile and easily damaged by careless anchoring techniques. The cabin and window openings in the superstructure are largely intact, but part of the forward weather deck roof has partially collapsed into the main deck, which is disorienting when you follow the top of the wreck around the perimeter. I have wound up inside the wreck, by accident, on several dives here, so be extra careful. The wood work on this wreck is stunning, and the bit of coal scattered on the foredeck near the coal hawse pipe reminds me that these old steam ferries were powered by coal. The wood benches still sit near the remains of the old boiler, where passengers once huddled to keep warm while transiting Lake Washington during our wet and windy winters. 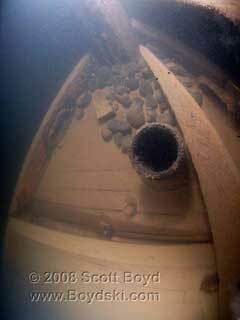 For more information on diving the wreck of the Dawn, please see Northwest Wreck Dives.